안녕하세요! 한양대학교 공과대학 글로벌 홍보대사 HISA (Hanyang College of Engineering International Student Ambassador)입니다. 오는 11월 1일 목요일, 오전 11시부터 오후 3시까지 제 1공학관 시계탑광장 앞에서 글로벌 플리 마켓 행사가 진행될 예정입니다. 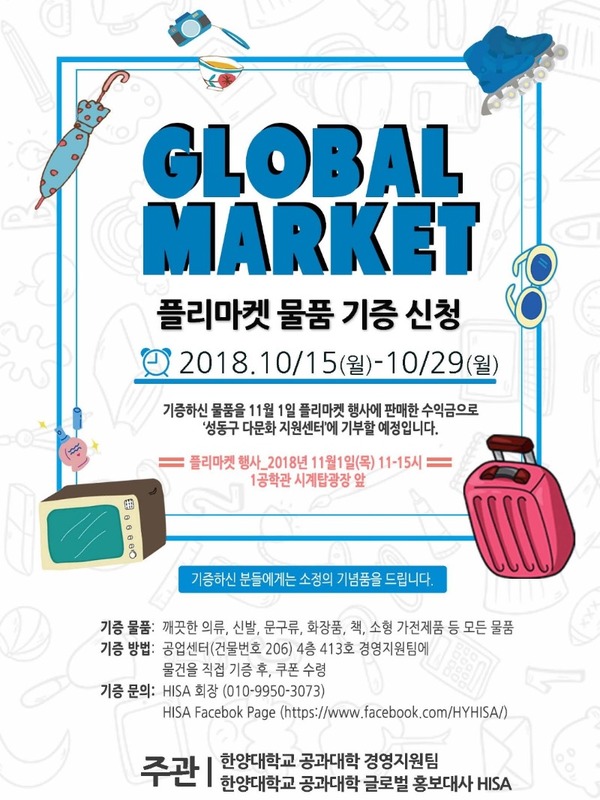 이와 관련하여 10월 15일(월)부터 오는 10월 29일(월)까지 공과대학 경영지원팀 (공업센터 4층) 에서 물품 기증을 받습니다. 물품 목록을 참고 하시어 사이즈가 맞지 않거나 버리기 아까운 의류, 사용하지 않는 문구, 화장품, 책, 소형가전 등을 기부해 주시면 됩니다. 물품을 기증해 주신 분들에게는 소정의 상품을 드립니다. 또한 행사 종료 후, 물품을 기증해 주시는 분들 모두의 이름으로 기부를 할 예정이니 많은 참여 부탁드립니다. This is Hanyang College of Engineering International Student Ambassador (HISA). 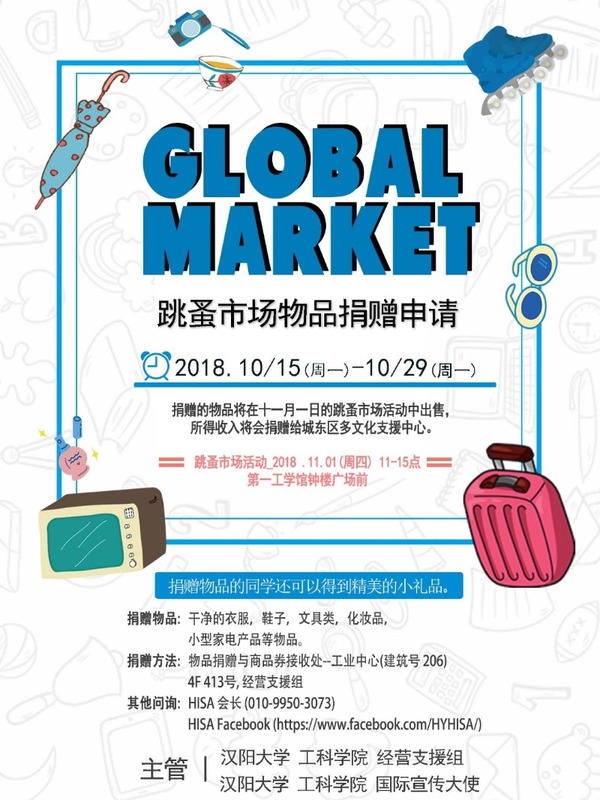 On this upcoming November 1 (Thursday),a global flea market event will be held from 11a.m. to 3p.m. in front of the clock tower of the 1st engineering building. 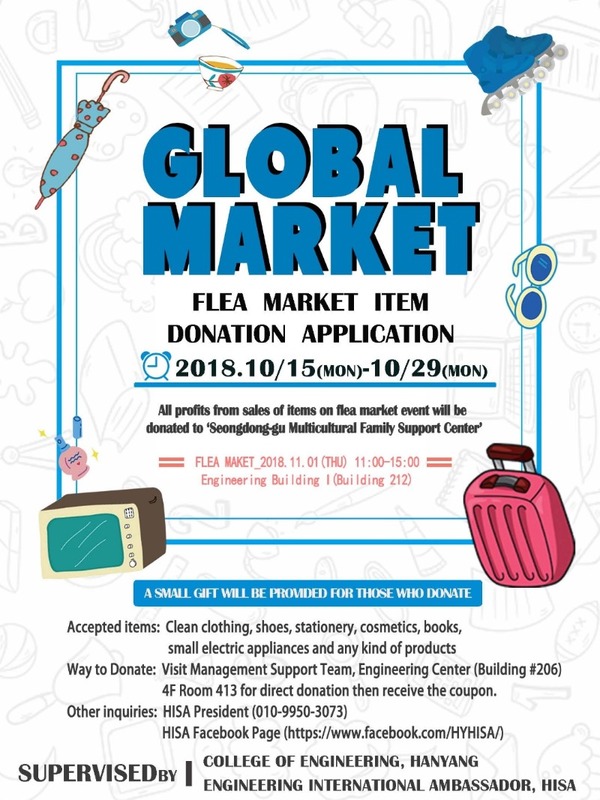 In this regard, from Oct. 15th(Mon) to Oct. 29th(Mon), the Engineering Support Team (Engineering Center-4th floor) will be receiving donation from students. The list of goods includes various items such as garments that do not fit in size, garments that are not to be used, non-used stationery, cosmetics, books, small appliances, etc. Also, after the event, donations will be made in the name of everyone who donates the items, so please join us.